I was wondering if you can make a habitat for beetles out of sand? and they will live normally and reproduce? Yeah, I think an important factor to keep in mind is to be sure the sand is wet. 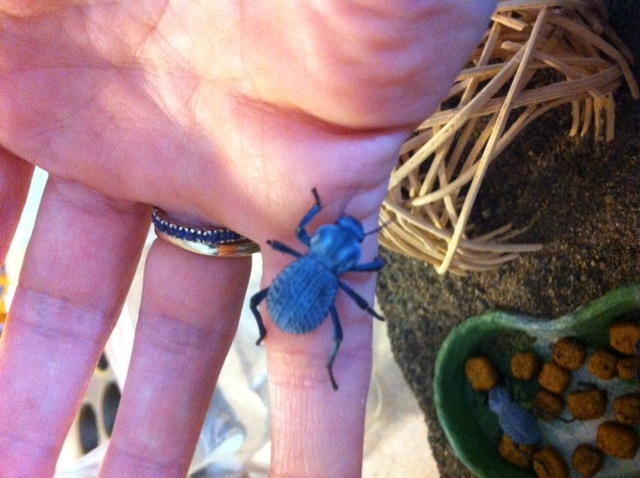 If you get Asbolus verrucosus (death feigning beetle), they can be kept on sand. 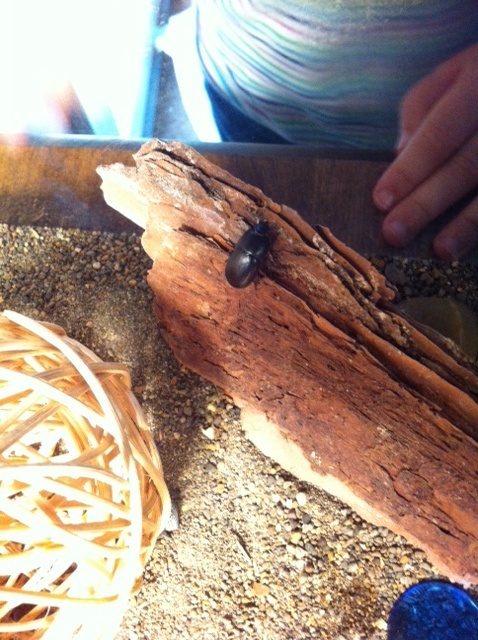 We also have two unknown types of darkling beetle in the enclosure as well. It is a communal tank, our beetles all came from bugsincyberspace.com. I highly recommend buying from there, Peter is amazing and really knows his stuff. Our beetles are fed a variety of (all organic) carrots, apple, blueberries, oranges, dog food, and non-organic fish flakes. They require no water and no moisture at all. The drier the better! Our substrate consists of the desert sand mixture from bugsincyberspace. We have some hides, a couple rocks, and a clip-on shop light with a halogen bulb in it for warmth. They are fun! No problem! Keep checking back at his site too, he constantly has new stock coming in, so something that might not be available right now, might be there in March. He is an honest businessman with a real passion for insects. 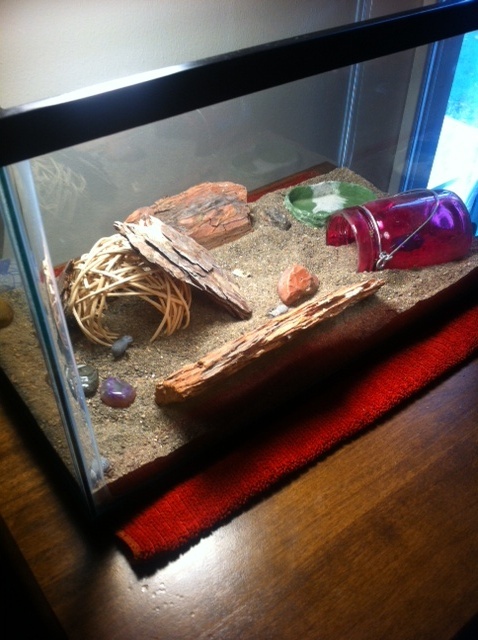 I am trying to figure out how to post a picture of our enclosure so you can see it. It is a 5 gallon fish tank without a lid, none of the beetles can fly. 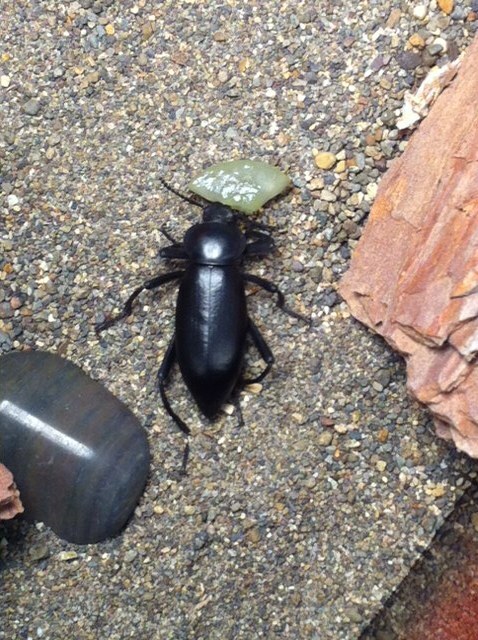 Most scarab beetles will not do well on sandy substrate, however some Tenebrionids and Carabids do well on sand and may even require it for oviposition. It all depends on what beetle species you have. We have lots of mating activity, but no egg laying. Which, I understand, is highly uncommon with this species. To my knowledge, only the BlueBeetle Genome guy and one other have been able to get Asbolus verrucosus beyond larval stage.